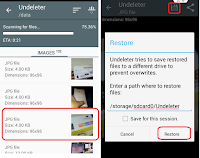 There may be other different ways to recover deleted data in android phone, here I am using a very handy app to restore all deleted data from phone internal storage and SD card. 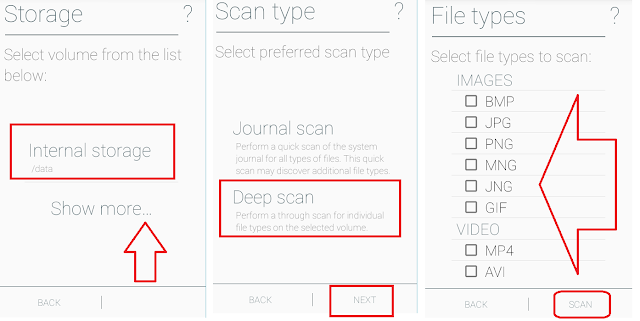 The app name is “Undeleter Recover Files & Data” its free and available in google play store, but this app required root. This app recovers your all videos, music, pictures, data and other types of files. Just follow these steps to know how to restore your all data in Android phone or tablet. 1. Go to play store download and install “Undeleter Recover Files & Data” for first time open, it will ask permission so grant permission. Tap on “Restore files”. 4. This will recover selected files, just tap on file and tap on “save icon” “save file” and tap on “Restore” your recovered files will save in SD Card “undeleter folder”. Once my sister was using my phone and accidentally she deleted some of my videos from my android device. She was very nerves and so afraid about how I’ll react. But I didn’t put her down, I just advised her to be careful next time. Finally I recovered the deleted videos on Android phone. Really looking forward to reading more. Really Great. Can someone help me..the app is asking for root i cant find what ? What is root access and how I know about root access?